Answer to Non-Muslims Questions Written by Dr. Zakir Naik. 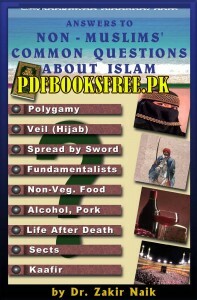 The present book contains answers to some common and frequently asked questions of Non-Muslims about Islam related to Polygamy, Veil (Hijab), Spread by Sword, Fundamentalists, Non-Veg Foods, Alcohol, Pork, life after death, Sects and Kaafir in English language. This book is now available here to read online and download. Click on the following links to read online and free download full book in Pdf format for offline reading and references.